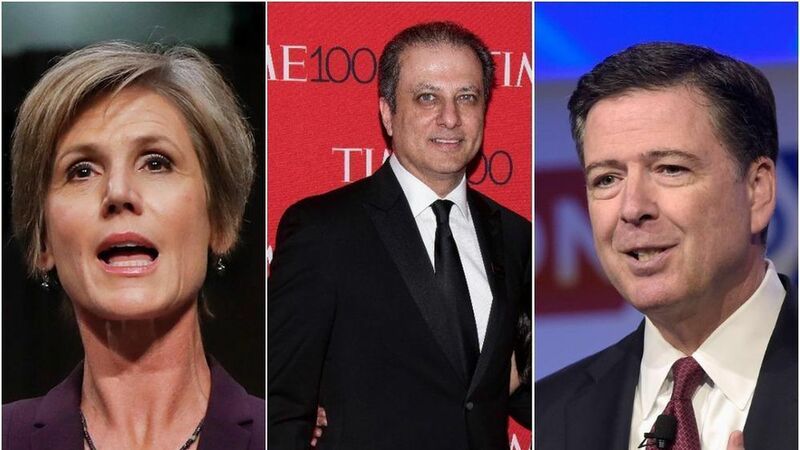 Among the most prominent officials President Trump has fired since taking office are Sally Yates, Preet Bharara, and James Comey. What they have in common: They all were investigating Trump when they got fired, and there's a Russia thread in each of their cases. Ordered the DOJ not to defend Trump's travel ban, which he issued within days of taking office. Put up a fight to continue his job even after Trump announced he would seek the resignation from all U.S. attorneys. Bharara was investigating Trump's HHS Secretary Tom Price for his financial investments. Bharara was also investigating corrupt Russian businessmen and officials (and a witness for the case was pushed or fell from a window the day before he was set to testify in another court case). Announced the DOJ would not prosecute Hillary Clinton over her emails, but then announced a new revelation about her emails right before the presidential election. Comey was, like Yates, investigating Trump's Russia ties, which he revealed on March 20.